Published by Mountainblog on 05/08/2013 . 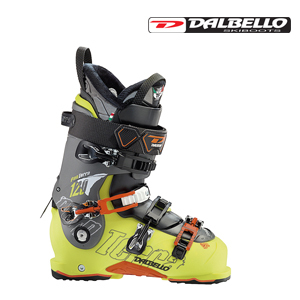 The PANTERRA 120 is geared for ex- pert level and high performance skiers. The PANTERRA 120 design incorpo- rates many of the structural and performance features of the popular Krypton KR2 construction and adds a sturdy and precise Ski/Hike cuff lock for supreme versatility. Also, a hi-grip rubber midsole and replaceable toe and heel are offered on the 120 to provide extra traction and durability when hiking. Dalbello’s 3 Piece Cabrio design pro- vides responsive and consistent flex with tenacious lateral and reward pow- er. Contour 4 Fit Technology allows for a close anatomic fit while accommodating the typical hot-spots many ski- ers encounter while the V.F.F. Fit System enables quick and precise forefoot width to be adjusted via the toe buckle. Modern, Rocker Stance Geometry al- lows skiers to take full advantage of their equipment by centering their body mass over the sweet spot of their skis for more power and control with less effort. Available with TRUFIT Comp fit sys- tem innerboots or optional I.D. Thermo “MAX” Custom Fit liners for lightweight comfort, warmth and shock absorption. Skiing has never been so easy! Calzaturificio Dal Bello s.r.l. is engaged in the development, design, manufacturing, marketing, and sales of technical sports footwear products. We exist for the sole purpose of producing technically excellent products that satisfy the commercial needs and requirements of our distribution partners and the performance and comfort needs of the end users. Our mission is to maintain and expand our position as a leading supplier in the worldwide winter sports industry. To this end, we are committed to maintaining highly trained and motivated employees and distribution partners who are dedicated to providing professional and excellent service to our customers. We are committed to achieving our goals based on the guiding principles of honesty, trust, integrity, respect, effective communication and quality leadership.